Overlooked by many historians when talking about the Battle of Britain, the rugged hawker Hurricane shot down far more enemy aircraft than the Spitfire and therefore rightly deserves to be kitted in our Wingleader series. Like the Spitfire, this is a printed kit that builds up into an amazingly accurate representation of this classic aircraft. The stringered rear fuselage is actually very similar to the full size and therefore quite authentic. The supplied rubber motor is a good starting point for flying, but performance can be improved by the substitution of better rubber at a later date. Hurricanes were famous for being tough and this one is no exception. The thick section wing is also great for high lift and the limited taper ensures good low-speed performance. 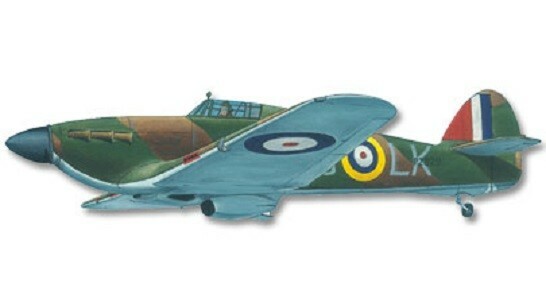 Hurricanes served in many campaigns in WWII so colour schemes are varied. From camouflage in the Battle of Britain to all black night fighters, the choice is yours. At 508mm span, she’s a little bigger than the Spitfire but the scale is the same. Kit includes: Printed balsa wood panels, stripwood, Plan and instructions, plastic Propeller & rubber motor, wheels, wire, moulded canopy & spinner. Adhesives and paint will need to be purchased separately.